These irresistible rolls are a famous Swedish breakfast item. They are made in a big tray or a baking sheet but I wanted to make them differently so I had the idea of placing them in the Muffin form, so they come out neat and tidy and easy to pick and eat. I must say it was a very good idea :) You will see them baking so perfectly, they were so beautiful in size and shape and taste! 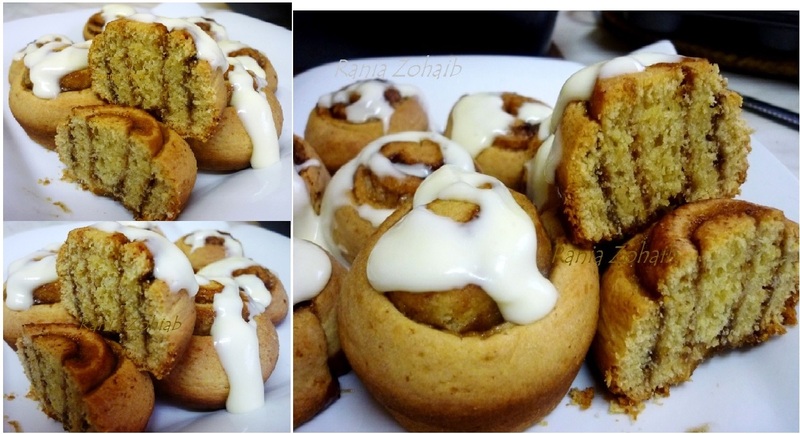 I used Honey to make it real sticky and I must say Super Duper and extreme tasty!! I have adopted the recipe from a Ladies magazine named “Tina” but as always I made some changes according to what I thought would go good, like adding honey* in it or using a muffin tray instead a baking sheet tray, adding brown sugar* in the dough , and i used dry yeast* instead of fresh because I didn’t have that at home . The good thing is that the dry yeast I buy is organic and they always write on the back of the pack how much of it is equal to how much fresh yeast and I find this so super and easy. If anyone making this resides in Germany then you can buy the “Alnatura Backhefe” it makes the dough so light and fine! *Just put all together and knead till you have a soft round ball of it, cover it with a cloth or a bag and let it rest in a warm corner, usually we do not give a rest time to the dry yeast products but I still do that to get a really soft airy dough : ) It mustn’t be for hours I left it like 40 minutes and did the other work in between. Keep the filling ready aside so you can sprinkle that immediately as you have rolled the dough out, don’t make any paste of them, just sprinkle all one by one that is much better and then just merge all with your hands later. *First of all spread the soft butter till all corners evenly. Let it stay another 10 minutes and then bake in a preheated oven on 170°C for 25 minutes. Make a cream and drizzle it as they are still warm, I made my frosting with cream like I make for my Carrot cake as that tastes toooooooo good . Mince Meat Buns…Soft and Delishhh…. The Coconut Cream Cake.....Heaven on Earth! !